Healthy eating at mealtime is pretty simple~ stick to meat & veggies and you're good. Snacks can be a little tougher. I usually go for things like raw veggies, Larabars, or trail mix, but it's fun to have something a little different. 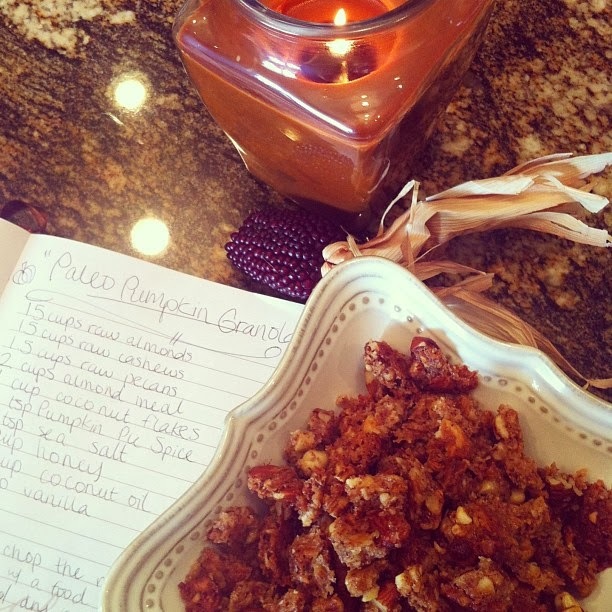 This recipe doubles as a healthy snack & a tasty dessert. It's even good for breakfast. It's perfectly sweet & tastes like a cookie crumble! Most granola is over-processed and full of sugar, but this is one you can feel good about indulging in. 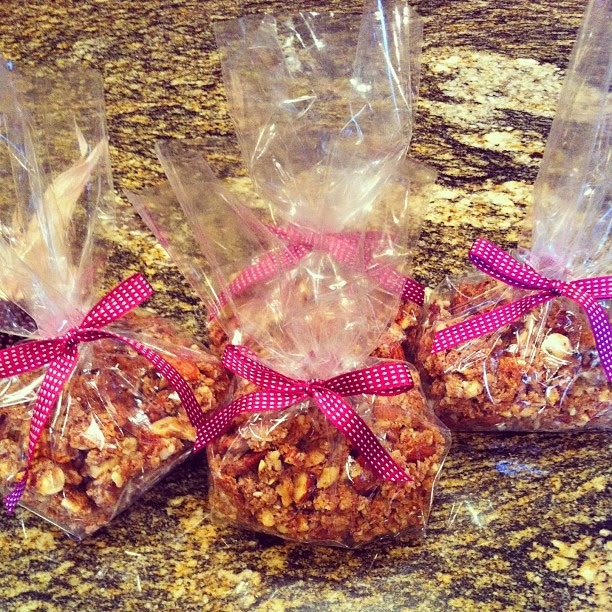 I use nuts and coconut instead of oats and grains to create the bulk of my granola. Then I replaced the sugar and unnatural binders with honey & coconut oil. No flavor is lost here, it actually tastes better. Any combination of nuts would work, these are just some of my favorites that I had on hand! I also really recommend the Pumpkin Pie Spice from Trader Joe's~ it's inexpensive for a large amount with no additives. I came up with this recipe as a snack for my boyfriend when he came over to visit. 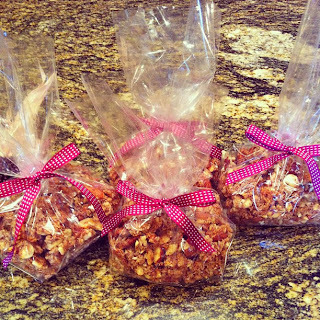 We munched on it over the weekend, then I packed up the rest into cellophane bags, tied with a ribbon, & shared them! This works great as a treat to give to friends & family as a little gift, just to let them know that you were thinking of them. Plus, it tastes amazing! 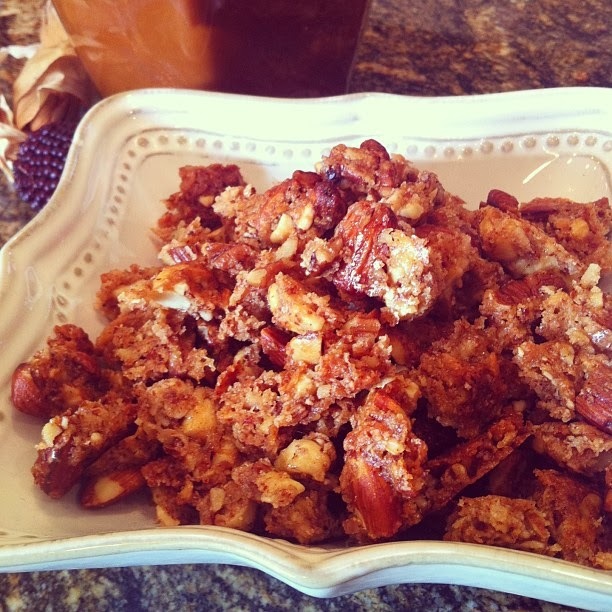 Roughly chop the almonds, cashews, & pecans by hand or using the "pulse" function on a food processor. In a large bowl, combine the chopped nuts with almond meal, coconut, pumpkin pie spice, & sea salt. Melt the honey, coconut oil, and vanilla, & stir into the dry mixture until combined. 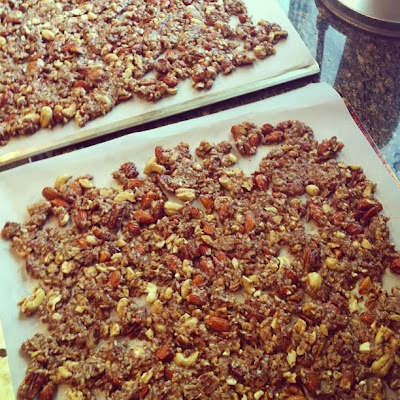 Spread out flat onto a cookie sheet lined with parchment paper (I needed two sheets). Bake at 400ºF for about 10 minutes, or until it begins to brown on top. If you are using two sheets, rotate them so that the browned one is now on a lower rack. Continue baking for an additional 4-5 minutes or until both sheets have browned. 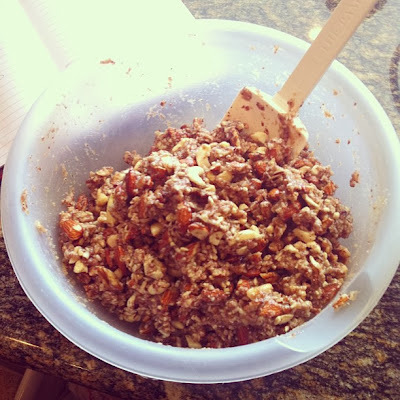 Use your hands to break up the mixture & crumble into chunky pieces. We used our fingers to snack on this, but it would be great as cereal with some grass-fed milk or coconut milk! This is super yummy! Love, Love, Love it! I was looking for a healthy treat to take traveling with me (one week post Whole30) and this recipe is amazing! Thanks so much for sharing. 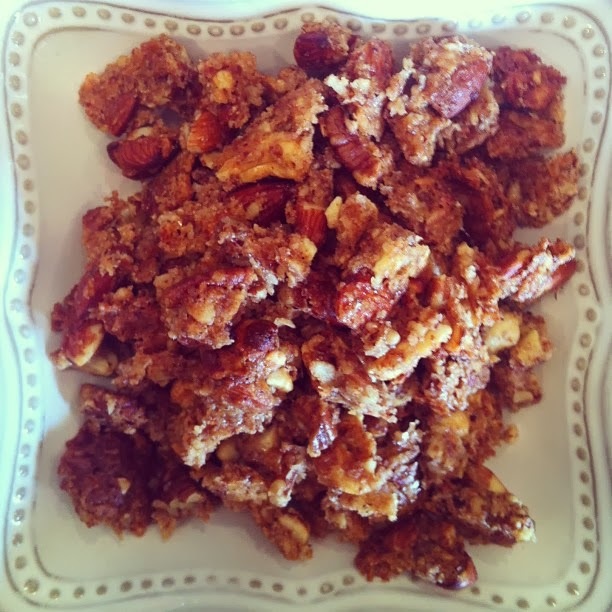 I really am thankful that I found your site and all of the terrific recipes that you have in your index - you are really going to help me in this new Paleo lifestyle I have chosen. You are very much appreciated! PS- do you think this would also be tasty with cinnamon, nutmeg and allspice (sort of an apple pie flavor) instead of the pumpkin pie spice? 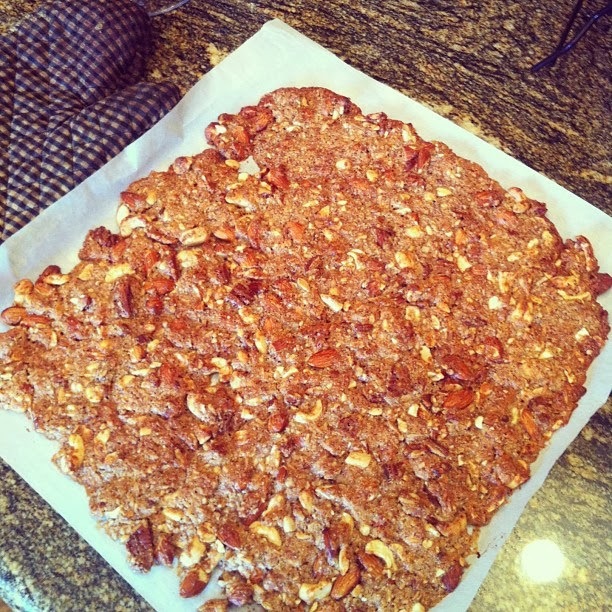 Could you add dried apple pieces or would they not hold up to the baking process? Just a thought.